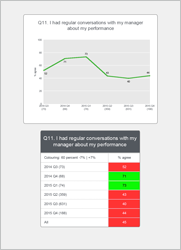 For surveys over multiple time periods, this report shows the trend of each rating and number question in a chart and table. Table cells are coloured Red, Amber or Green ("RAG") to highlight negative, negligible and positive change. Useful for tracking and analysing the development over time in any value question, including NPS. The frequency and range of data can be varied using the Timeframe button.